CT CoreTechnologie GmbH provides a product called 3D_Evolution which enables data conversion between CAD systems complete with history and parametrics (if required). Models are converted into a 3D_Evolution native format (which enables the representation of all feature types in use today). This data is optimized and information added to enable the automatic (re-)generation of the model in the target-system. Finally, the model is assembled feature by feature using the target-system API. Both individual parts and complete assembly structures can be converted. Another interesting part of the system is the 'Simplifier' module. 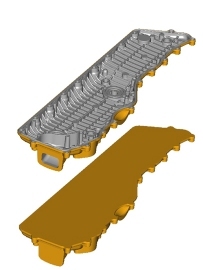 This module can be used to simplify parts and assemblies to reduce the overall model size for Digital MockUp (DMU) purposes. The result is the bounding geometry of the original model or entire assembly (with interior geometry removed). A useful feature of the system enables a user to specify those details which should be preserved following the automatic conversion process.